Good morning! Today's Twisted Tuesday challenge is super fun one! We were to create a card using kraft card stock as our main focus and this week's twist is to use a recycled item. My recycled item is the soda tab I have my ribbon threaded through. I was looking at my designer rosette die the other day and I kept thinking that it would make a neat fence and so I thought I would see what sort of fence I could make. I first stamped my card stock using my woodgrain background stamp and then I ran it through my big shot machine using the rosette die. Then I sponged each edge and all along the outside and the fence became more visible. I threaded my ribbon through my soda tab and I added that to my card along the bottom of the fence. I cut out two leaves using the little leaves sizzlits die. Next, I cut out and added the daisy flower which I embossed the yellow center using the square lattice emobssing folder. For a final touch I added a few white dots using my white gel pen and lastly I stamped my sentiment. If you try to recreate this same fence you will want to make sure that you sponge all along the edges and creases, that really made all the difference. What a gorgeous card! I love the fence and the background. And what a fabulous idea of using the soda tab. I've never played in a Twisted Tuesday challenge, but if they have winners, you win! This card is truly truly amazing. I can't recreate it because I don't have the stuff, but I'm still pinning it just b/c I like to look at it! Cool Card Patty--I love the fence! You are so creative! Great use of the pop tab! Great job! 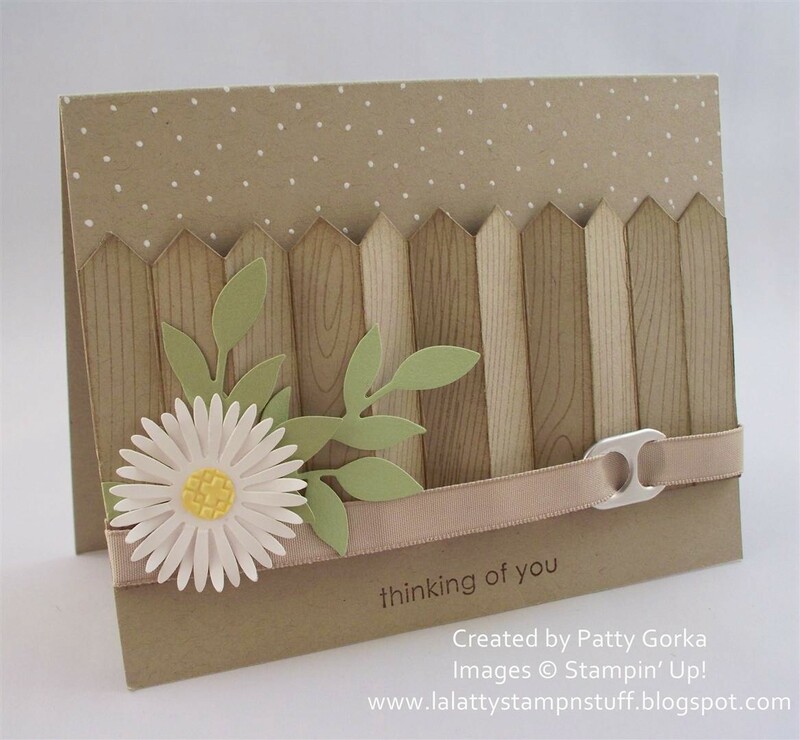 Beautiful card Patty!!!. Love the effect on the fence!!! and that flower is gorgeous!!! What a beautiful card! And the use of the soda pull-tab was very creative. Such a sweet card. I love the fence with the flowers and that soda can tab is pretty cool!